If you read my review of the 2016 MacBook Pro you know how much I dislike the keyboard on it. Along with that I have been reading Norman Chan on Tested.com, co-workers, gaming sites, and “computer experts” talking mechanical keyboards and how wonderful they are, my interest was piqued. My goal for a keyboard is for it to be comfortable and to give a reliable amount of feedback for my not-so-fast touch typing. I don’t need it for “gaming” or a crazy amount of n-key rollover. Just something solid, reliable, and comfortable. I would have loved to build a keyboard kit with all the soldering and programming that entails, but I have other things I would rather be doing. So I spent months shopping and comparing every mechanical keyboard I could lay my hands on. I eventual bought a Corsair K-something-or-other. I quickly figured out that the keyboard required software installed on the computer to work. That is a no-go for me as they keyboard will be moved from Mac to Windows to Linux and I want it to work the same way no matter what it is plugged into. I researched a bunch more keyboards and found that most of the popular ones require software, usually only available for Windows, to do more than act as a basic keyboard. Then I took another look at the Cooler Master series of keyboards, turns out all of its features are programmed and stored directly on the keyboard. That means your settings and macros are stored and usable even when you switch the computer it is plugged into, exactly what I was after. Cooler Master MasterKeys keyboards come in many variations, no back-light, white or blue back-light, RGB back-light, also Cherry MX switches in Blue, Brown, Red. I chose a Cooler Master MasterKeys Pro S, with RGB back-lighting, Cherry MX Blue switches, in a TenKeyless (TKL) design for home use and for the office I chose the exact same keyboard but with Brown switches. I generally like full-sized keyboards with number pads, but at work I have been using an Apple Bluetooth keyboard for the last 7 years or so and have gotten used to it. When I went looking for a mechanical keyboard I discovered there are 3 typical sizes. I chose a TKL size as I don’t really feel the need for the number pad and I like the extra space it leaves on my desk. Having that extra space for the mouse is great. For my home computer I wanted to go all in with the clicky-clicky of Cherry MX Blue switches, but for the office I went with the Brown switches which do not make the click sound. I then did a blind, or rather deaf, test and determined that the Blue and Brown switches in the Cooler Master keyboard are exactly the same with the exception of the click. With both keyboards I tend to “bottom-out” the keys, which adds a lot more noise to my typing. I have found the solution to be some inexpensive O-ring switch dampeners that have made typing quieter with the added feature of shortening the throw of the keys. I need back-lighting so that I can see the keys in darker environments, I don’t really need the RGB and the fancy features that come with it, but I do get a kick out of having the keys light up bright purple when I touch them. Fun, but not necessary. Wow, these keyboards are tall! I find it impossible to type on them without a wrist rest. I like the Glorious Gaming Wrist Pad in Full Size. I tried the TKL version, but found it to small as my wrists, especially the left one, sits outside the width of the keyboard. The firmness and height of the wrist rest is exactly what I needed. Ergonomically a keyboard should tilt slightly down and away from you and not up and toward you where your wrist are bent stressing out and leading to carpal-tunnel issues. With my old keyboard I was able to attach supports to the front of the keyboard lifting it, the Cooler Master keyboard is so tall that I don’t think lifting the front would be a very good solution. At some point I may build a mechanical keyboard from a kit just so that I will have more control over the angle and height it. I bought some fun keycaps to replace the “Cooler Master” OS specific keys and the escape key with Portal characters. Love them! You can build from a kit, you can build from parts sourced from all over the world, you can buy a ready-made keyboard like I did and customize it with different keycaps. You can get a keyboard like the Planck that has fewer keys but may be faster for a dedicated typer after a transition period. You can even get keyboards that are just a grid of keys for assigning macros to, and not just for gaming, you could create macros to type things for you that are typed often. I really like the Cooler Master MasterKeys Pro S RGB keyboards, both the Blue and Brown switches are exactly what I was looking for. Posted in Computers, Electronics, Mechanical Keyboards, Uncategorized. 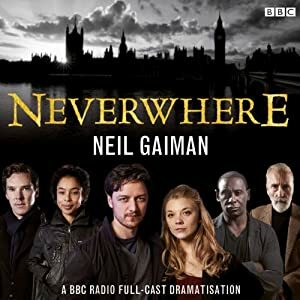 DO NOT LISTEN TO THIS VERSION OF NEVERWHERE! I love Neil Gaiman’s writing, and I have loved every Neil Gaiman audiobook and dramatic performance I have heard until this one. This version of Neverwhere is overproduced with sound effects and over acting that make following the story almost impossible. I am shocked by the positive ratings it has received on Audible, so apparently someone likes it. Read or listen to the unabridged story first then maybe give this one a try, I got it as a special offer on Audible for $1.95 but even at that price I feel like I was ripped off. Adapted for radio by the award-winning Dirk Maggs, this captivating dramatisation features a stellar cast including David Harewood, Sophie Okonedo, Benedict Cumberbatch, Christopher Lee, Anthony Head and David Schofield. Contains over 25 minutes of additional unbroadcast material, including extended scenes, bloopers and outtakes. I rate the story of Neverwhere a 10 out of 10 but this production of it is a 2 out of 10. Read or listen to the unabridged version. Posted in Audio, Books, Fiction, Uncategorized. Looking to hone my SEO skills I poked around inside of Safari Books Online for just the right book to show me the light. I have been building web sites for 17 years now and know a fair amount about how the search engines work. By "Search Engines" I mean Google of course, as most of the others have fallen to the wayside. But I have not actively studied SEO techniques in a long time and I figure now is the time to brush up. I really liked this book, it is 336 pages of no-nonsense advice and direction on the why and how of SEO including a lot of relevant information that the other books have left out. Techniques and best practices for search engine optimization are constantly evolving. This visual guide to SEO is fully updated with information on the latest and most effective ways to move your website up in the search engine rankings. Internet marketing guru Kristopher Jones, a frequent keynote speaker at interactive marketing conferences, explains all the key concepts in a visual format so you can see how they work and what to do. Learn about keyword generation, internal linking, URL structure, content creation, using social media, and more. 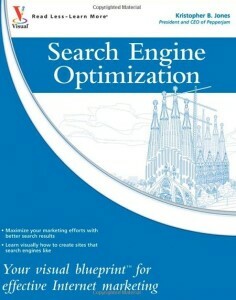 Search Engine Optimization: Your visual blueprint for effective Internet marketing, Third Edition helps visual learners master and maximize SEO techniques. I rate this book an 8 out of 10 and recommend it to anyone looking to learn more about search engine optimization and pay-per-click search engine advertising. I read Search Engine Optimization: Your visual blueprint for effective Internet marketing on Safari Books Online using their app on my iPad.